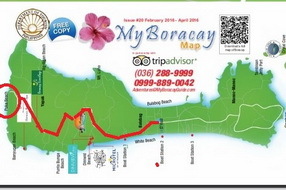 My Boracay guide publishes an updated quarterly map of the island and all it’s newest hottest establishments. You can use this map to guide yourself through an ultimate vacation getaway and come back with some stellar photos. 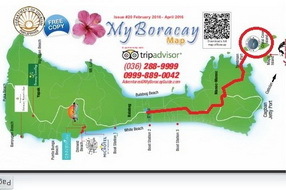 Let’s put the map to practical use by locating the 5 Best Boracay Photo Ops, namely Puka Shell Beach, Willy’s Rock, Mt. 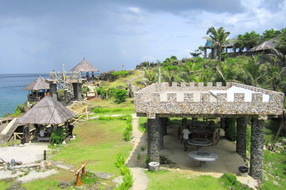 Luho Viewpoint, Crystal Cove and Kitesurfing at Bulabog. 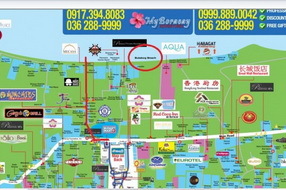 Let’s have the starting point for all destinations be at Budget Mart D’mall, since it is the most central location in Boracay. From D’mall Budget Mart, Main Road, Station 2, you can take a tricycle. 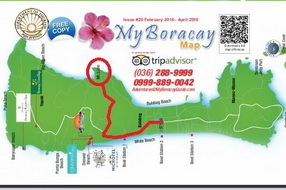 If it’s chartered just pay Php 150 and if not you can pay Php 25. 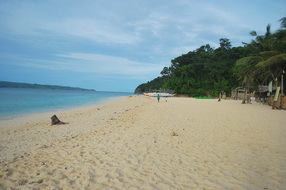 Puka Shell Beach is one of the most visited places in Boracay because of the shells scattered everywhere and most of all, the serene environment it brings. 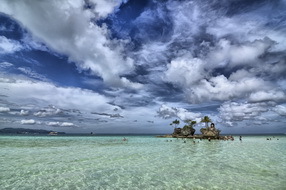 Popularly known as Willy’s Rock, Boracay Rock is the iconic symbol of the island. Your stay will never be complete if you don’t step foot here. Going from D’mall Budget Mart, you can take a tricycle (Pay Php 10 per person) and tell the driver to drop you off at Willy’s Beach Resort. From here it’s only a few steps away from Willy’s Rock just off White Beach. 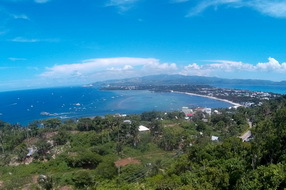 Want to see the panoramic view of the whole island? Take a chartered tricycle from D’mall Budget Mart (Php 150- Php 200) and just tell the driver to drop you off at Mt. Luho Viewpoint. It is going to be a 10-20 minute ride and an entrance fee of Php 70 will be collected before going up. 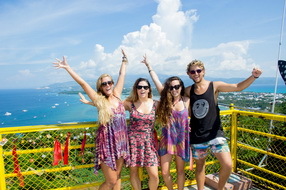 Discover and be amazed with the beautiful sceneries that you’ll see when you’re on top! The perfect selfie shot with the island in the background. 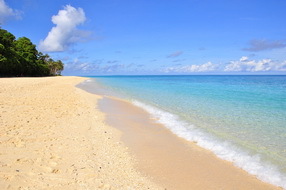 Boracay’s neighboring island Crystal Cove is a must visit! It’s a 30 – 45 minute travel from Budget Mart but it is totally worth it. Indeed, this is where you can take a lot of photos while trekking to the coves and caves. 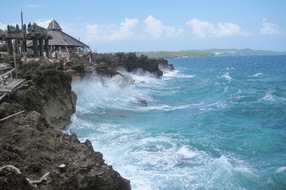 Explore nature at its best as you will see rock transformations and crystal clear tropical ocean waters. From Budget Mart, take a tricycle for Php 20 per person (Php 100 for chartered) and let the driver know that you’re going to the Cagban Port. 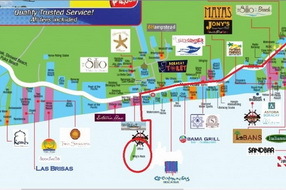 Look for the Crystal Cove Booth near the Boat Ticket Booth and you can inquire from their staff about the schedule and rates going to Crystal Cove. 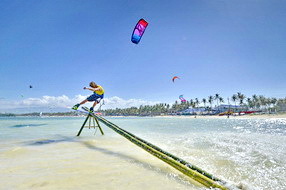 The best kitesurfing location in Asia is found here in Boracay! 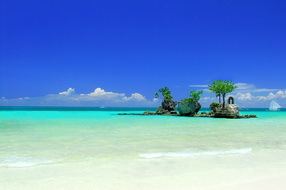 Bulabog or Boracay’s “back beach” is known to be the home of blue waters and strong winds. 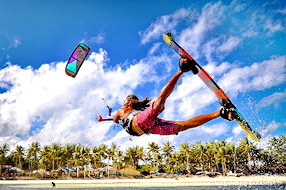 If you’re on the island by the End of October – April, check out the thrilling views of kites filling high in the skies and boarders cruising along the waters doing all kinds of flips and tricks off Bulabog Beach. Bulabog is very near to Budget Mart and you don’t need to ride a tricycle. It will only take you 5-10 minutes by foot to reach the area. Feel the calm breeze as you enjoy watching the kite boarders do their thing! These are just some of our recommended best photo ops in Boracay but honestly, every moment on the island is worth remembering! This entry was posted on 星期二, 二月 7th, 2017	at 5:28 下午	and is filed under guides-zh-tw, 最近	. You can follow any responses to this entry through the RSS 2.0	feed. You can skip to the end and leave a response. Pinging is currently not allowed.